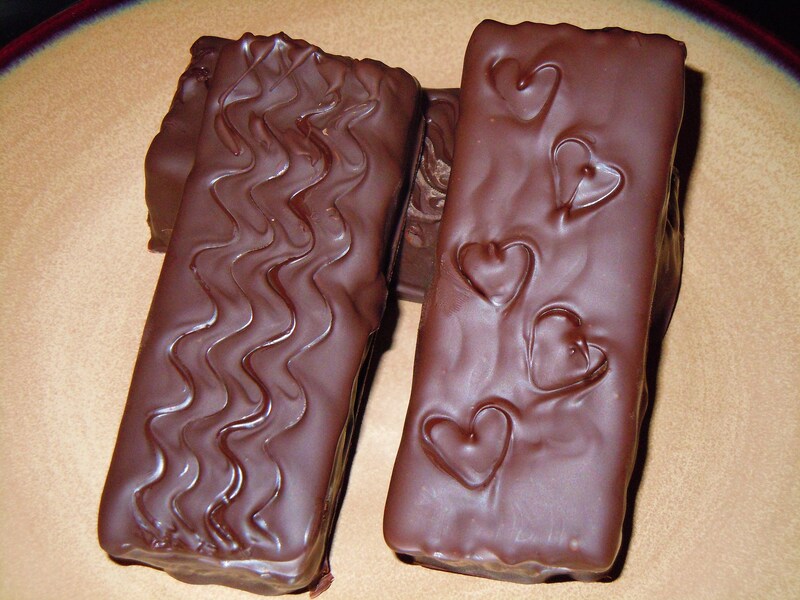 Candy Bars – gluten-free and vegan, but noone will ever know! As I stated in an earlier post, Wynne, our Produce Manager at the Cordata Co-op, really wanted me to make candy bars for a demo, and today she got her wish (just in time for Valentine’s Day). I found a recipe for “Three Amigos” candy bars on about.com – think Three Musketeers, except way better and more truffle-like. This recipe looked super easy, and I was not disappointed! I only used two ingredients: chocolate chips and a container of Suzanne’s RiceMellow Créme. It took about 10 minutes (including melting the chocolate chips on the stove) to prepare the inside of the bars, and then you have to wait for it to set (at least 4 hours or overnight). Then I just melted some more chocolate chips, dipped the bars in them, refrigerated them for about 10 minutes and voilá, I had super delicious candy bars that tasted like I’d slaved all day in the kitchen! People couldn’t believe how simple they were to make and I gave out a ton of recipes to customers today – I have a feeling there are going to be some sugared-up households in Bellingham this weekend! I used the new SunSpire Chocolate Dream Chocolate Chips, and with Suzanne’s “marshmallow” creme these candy bars are vegan (no dairy or eggs), nut-free, and gluten-free (there is soy in both the chips and the creme). I used two forks to dip them into the melted chocolate – I made about 100 little cubes instead of cutting the filling into 10 bars (for sample purposes) – and found that it worked well to cover the bar/square in chocolate in the bowl and then gently push away the excess chocolate before moving them to my parchment lined baking sheet. It’s a little cumbersome at first if you aren’t very experienced with dipping things in chocolate, but they’ll taste just as good even if they’re not pretty. If you can’t find vegan marshmallow cream where you live, you can substitute regular marshmallow cream (and they still make Marshmallow Fluff!). You could probably even throw plain marshmallows into the melted chocolate to get a similar result (you may want to add a T or two of water to the mixture). I highly recommend that you whip up a batch this weekend. In no time at all you will be everyone’s best friend! Prepare an 8×8 pan by lining it with aluminum foil. Spray the foil with non-stick cooking spray. Put half of the chocolate chips in a double-boiler with simmering water and melt (you can use a heat-proof bowl on top of a small saucepan if you don’t have a double-boiler). You can also place the chips in a microwave safe bowl and melt them in 45 second bursts (stir in between). Once the chips are melted, add the container of RiceMellow Créme and stir until the mixture is smooth. Pour it into the prepared pan and smooth it to an even layer. Refrigerate until chilled thoroughly, at least 4 hours or overnight. Once the nougat is completely set and firm, melt the rest of the chocolate chips using the same method as in step 1. Let cool slightly before starting step 6 (about 5 minutes). While the chocolate is cooling, remove the candy nougat from the fridge and pull up on the foil to remove it from the pan. Place on a cutting board, and using a sharp knife, cut the candy in half, then cut each half into 5 bars. Line a baking sheet with foil or parchment paper. Using two forks or dipping tools, submerge one bar at a time into the melted chocolate. Remove the bar from the chocolate, allowing excess chocolate to drip back down in the bowl (I found it worked well to lightly scrape the bottom of the bar on the side of the bowl to remove the excess). Place the bar on the baking sheet. Place the bars in the refrigerator for about 10 minutes to set the chocolate. Once set, the bars can be served immediately. This entry was posted in Demos, Recipe and tagged chocolate, Dairy Free, Demo, dessert, Egg Free, Gluten Free, Recipe, snack, Vegan by Melissa Elkins. Bookmark the permalink. These are cute and lovely candy bars! I would love to try and make it. This is going to be really delicious.